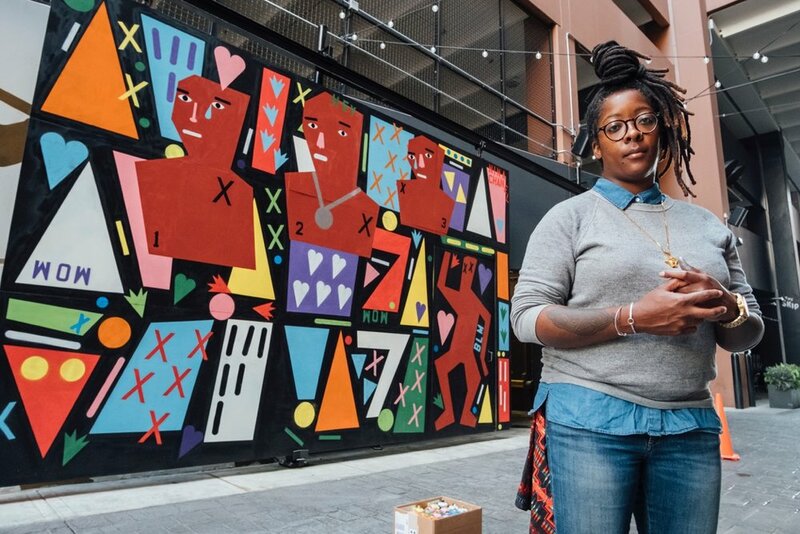 Addressing pop culture and racial conflicts, Nina Chanel Abney paints scenes rooted in autobiography, current events, and traditional storytelling. Driven by a fascination with the perceived importance of celebrity news as compared to politics, she works in a pop-surrealist style, employing cartoonish figures and playful compositions to echo the perpetual stimulation of the digital age. Abney’s paintings present new ways of approaching loaded topics and generating discussion, allowing viewers to come to their own conclusions. In the “Always a Winner” series, which addresses the Black Lives Matter movement, police batons are phallic symbols and clown makeup suggests racial distinctions. The series reflects the absurdity and information overload of the internet era and questions the ways in which people are affected by abuses of power. Nina’s work is in the permanent collections of the Whitney Museum of American Art, the Brooklyn Museum, the Rubell Family Collection and the Corcoran Gallery of Art.